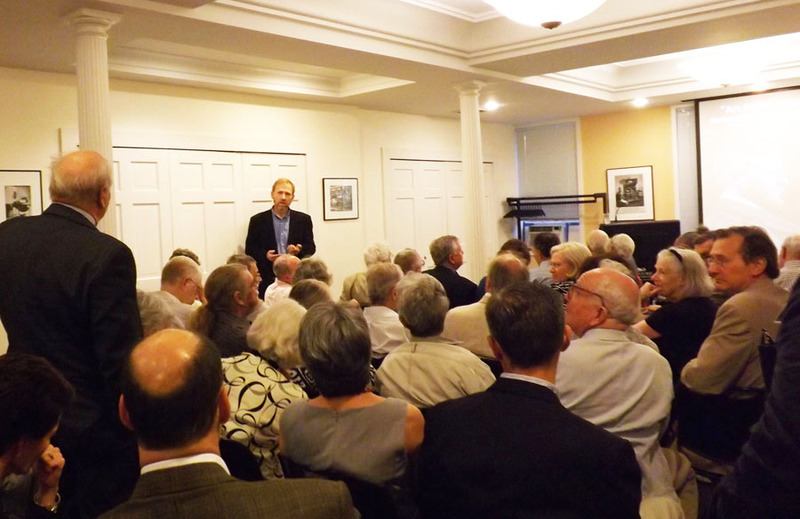 On Thursday, September 13, members of Historic New England’s Friends of the Library and Archives enjoyed a reception in the Otis House courtyard followed by a presentation on Joseph Everett Chandler by Dr. Timothy Orwig. Orwig captivated the audience with An Architectural Sherlock Holmes and his efforts to rediscover the work of architect Joseph Everett Chandler. Orwig used diaries and other material in Historic New England’s collection to explore Chandler’s work as an architectural historian and building restorer, and his role in the Colonial Revival movement and the historic preservation movement in New England. Read Orwig’s article on Chandler on page twenty-five of the Winter/Spring 2011 issue of Historic New England magazine. Friends of the Library and Archives enjoy many benefits including invitations to events designed to appeal to their area of interest.